After a couple relatively quiet weeks from the 2018 rookies, they showed out in a big way in Week 10. There was a first-round rookie who finally had a big week and a second-rounder who came through as well. The Rookie Review Datasheet is up-to-date and with trade deadlines and fantasy playoffs looming, there’s no time to waste. Let’s get to the 2018 Week 10 Rookie Review! After Carlos Hyde was traded from Cleveland to Jacksonville, #ChubbSZN has been in full effect. 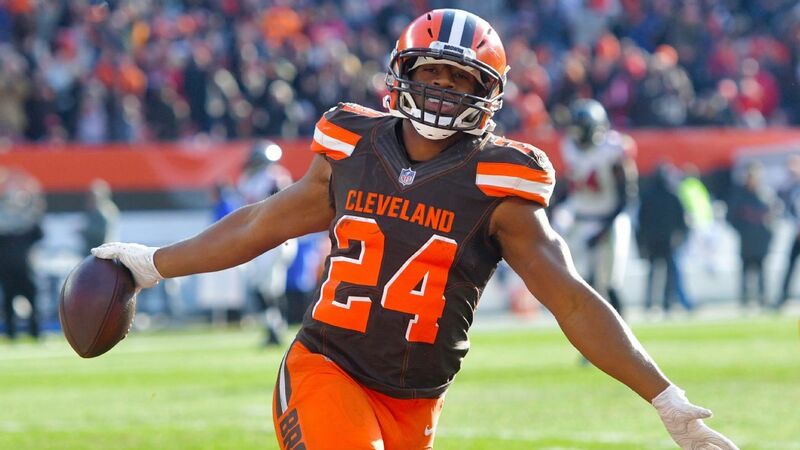 Since Week 7, Nick Chubb has averaged nearly 22 opportunities per game to go along with 113.5 yards from scrimmage. He’s making me feel damn good about having him ranked as my rookie 1.02 throughout the preseason process. If you didn’t draft him or trade for him while Hyde was still in town, you’re better off waiting until May at this point. Even with Theo Riddick in the lineup in Week 10, Kerryon Johnson saw six targets to Riddick’s seven. Yes, the Lions trailed Chicago 26-0 in the second quarter, but the fact Johnson wasn’t taken out due to that game script is a promising sign moving forward. One rookie running back that was limited by game script, however, was Sony Michel. Once the Patriots entered the second half trailing 24-10, Michel saw just four touches. This could be partially due to his return from injury, and I won’t be the one to bet on New England being in negative game scripts very often, but it’s still something to monitor regardless. Week 10 was a great week for my confirmation bias. To go along with Chubb’s breakout week, Anthony Miller joined in on the fun. Even with Allen Robinson returning from injury and having a big week himself, Miller put on a show of his own. He turned six targets into five catches, 122 yards, and his fourth touchdown of the year. The target and yardage numbers represented 20% and 34% of the team totals, respectively. The Bears offense has been clicking as of late, and Miller will surely be a direct beneficiary. After being signed as an undrafted free agent, then cut, then brought back, Robert Foster teamed up with Matt Barkley to lead both the Bills and Jets with 105 receiving yards. I’m not going to get crazy and predict Foster as a fantasy mainstay moving forward, but he’s at least worth a free look on your waivers. Christian Kirk – He somehow only managed to put together eight yards on six targets. I believe in Josh Rosen long-term, and Larry Legend ain’t gonna be around much longer. With a Week 11 date with the lowly Oakland Raiders on the horizon, his price may not stay depressed much longer. Tre’Quan Smith – Smith’s breakout game has yet to materialize. He didn’t record a single target in last week’s spanking of Cincinnati, and the Saints have now signed Brandon Marshall. Despite his lack of production, the rookie from UCF was on the field for a team-high 67% of the WR snaps. It wouldn’t be surprising if the luster has worn off with the Smith owner in your league. Antonio Callaway – For similar reasons to Tre’Quan, Callaway is a buy-low target. Disappointing production and still getting targets, Callaway might be in a better dynasty situation with Baker Mayfield’s youth on his side. Seriously. This rookie tight end class leaves a lot to be desired. I was never high on the crop of incoming tight ends, but I didn’t foresee it being this bad. Christopher Herndon, Dalton Schultz, and Mike Gesicki were the only rookie TEs to register targets in Week 10. They turned a collective seven targets into six catches and sixty yards. Do yourselves a favor and just wait on the 2019 class if you’re in need of a young tight end. That’ll wrap it up for the 2018 Week 10 Rookie Review. Be sure to use this information in the article and the Rookie Review Datasheet to your advantage as we get closer to trade deadlines and the fantasy playoffs. Whether you’re contending or looking towards 2019, there are moves to be made! Thanks as always to Pro Football Reference, Football Outsiders, AirYards.com, and FantasyADHD.com. Good luck in Week 11!